I had the same problem that you had. The app was working fine and like you I thought the days of crashing were over. However about two days ago It crashed and like you, it would kick me out and do a pseudo reboot. Nothing short of deleting and reinstalling the app solved the problem. I hope they get all the bugs worked out. 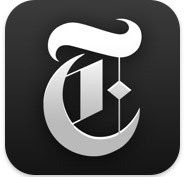 I really like the NYT app and would be happy to pay, but only if it is reliable. I like the app too if therecwould be now crashes. Uch better than the new the daily. I would not mind to pay neither if it is stable. It is a shame that they have problems. NYT does not build articles especially for the iPad and something there are open tags which keeps the app crashing. They should do a better job. Same problem for me. Seconds after I start the NYT app, it appears to reboot my iPad. Downloading it again makes no difference for me. Try to delete it and then to sync from iTunes, this helps sometimes. I have been a NYT subscriber for years. I bought the ipad to read the paper and go "paperless"
The NYT app does not function. I am canceling my subscription. PERIOD. Same here. Deleted and re-installed the app several times but the problem persists.